Gerry Virtue | Author of "Kathmandu, the Novel", and "On the Road with Geoff and Jules"
"With creepy villains and good old-fashioned heroes, Kathmandu, the Novel is a terrific story. I so want to adopt young Ashok." "I was riveted from the first line to the last paragraph. A real 'tour de force' - I'm hanging out for Book two." "The author masterfully weaves modern day heroes and villains, a dash of love story and the history/mythology of the Kathmandu area. His natural storytelling talent and his knowledge and love of Nepal come together in an exciting and rewarding read." - Amazon Kindle's "Voracious Reader"
"A really unusual story in a terrific setting. Enjoyed it immensely and wanted more, so I'm happy Book Two is coming along soon." 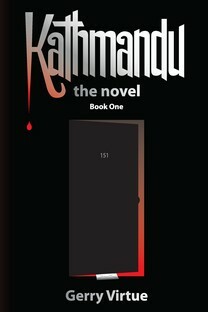 "You will be beguiled by Kathmandu, the Novel. With the skill of a Newari woodcarving, the contours and intricacies of the ancient and the modern, the imaginative and the everyday come to life. Best of all, the valley and the mountains are ever present." "The Kathmandu novel is a real spellbinder. Great adventures and great characters! I loved this novel." Gerry Virtue is the author of Kathmandu, the Novel, Book One and On the Road with Geoff and Jules. Read about his books and buy them here. Aid worker Andrew receives an apparent business letter by mistake and finds himself threatened by a mysterious group with a deadly objective. He and his English girlfriend, Kate, go to Sadananda, an old Hindu holy man, for help. The old man sifts through bazaar gossip and makes an alarming connection between a shadowy Englishman and the secretive group. Meanwhile, Sadananda distracts them with tales of the ancient Himalayas: a vast lake that vanishes; the trials of the Buddha's chief disciple in the Great Forest on his way to the high Himalayas; and a fugitive Nepalese prince escapes death in Kathmandu and persuades the great king of Tibet to help him regain his throne. 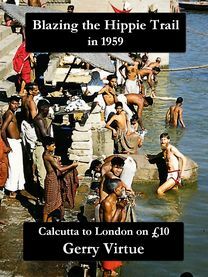 Christmas 1959, Calcutta. Gerry is stranded in the Salvation Army Hostel. He meets Geoff, an eccentric loner. Only a few pounds between them. How to get to Europe overland? No money for a plane; no internet; no social media; no guide books; no useful maps; no ATMs; no clear options. Across Asia to Europe by land. But how? There are no hippies, no Hippie Trail. Nobody will even hear about hippies for another five or six years. It’s all a bit chancy, really. But they give it a go.